Yesterday we pointed out that God is not boring and the Bible is not boring. So why is some preaching boring? Two more facts and then we’ll get to the heart of the matter. . .
3. Life is not boring. Even in a safe neighbourhood where nothing seems to happen and people may complain of being bored, life is not boring. With all its complexities, doubts, troubles, questions, issues, fears, hopes, changes, challenges and memories, life is not boring. As we preach we preach from the inspired text to people desperately in need of what God has to say through the Word to them. Preaching with relevance should not be so hard, as long as we are in touch with life and its challenges. 4. Church is not boring. Many churches are, in fact, boring, but church itself is not. God’s glorious plan to call out and redeem a bride for His Son, working with materials that are still very much “works in progress” to build a beautiful temple, that is anything but dull. Now when we turn church into our own little kingdoms and lose any real awareness of what God is doing, then church can become a dull place of petty politics and personal preferences, but church from God’s perspective is never a dull matter. So why is there dull and boring preaching? It must be something to do with the preacher! Hate to say it, but perhaps this can be a nudge to ask God to search our hearts and show us if there is any of the sin of boring people with the Bible in us? Actually, why not pray and then ask a few folks? It could be delivery, it could be personal manner, it could be that all the enthusiasm we generate for conversation about sport and family evaporates when we stand to preach. It could be a lack of personal vibrancy in our walk with the Lord. It could be a lack of sleep (perhaps due to number 4 above!) It could be something easy to change. Or it could be that we genuinely are finding God and the Bible and life and the church to be boring. If so, let this post be your call to a sabbatical or urgent action. 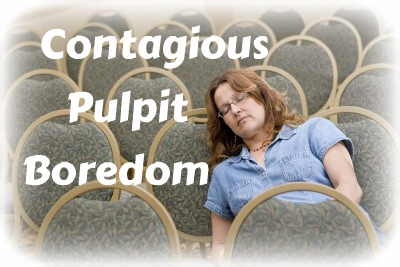 Boring people through preaching is too dangerous to let it happen even once more.